Jonathan Sae-Koew overcame significant barriers to achieve personal growth through higher education. I grew up in the suburbs of Perth, Western Australia, attending both government and private high schools. I had an affinity for the arts, sciences and a particular interest in English literature, but always struggled finding the motivation to apply myself to my studies. I suffered a lot of bullying, and was made to feel inadequate by my teachers who told me I wasn’t good enough to go to university. Ultimately, they refused to teach me, encouraging me just to sleep in class and letting me go home early. Although my teachers streamed me out of ATAR, I still aspired to go to university. Most of my family had pursued tertiary education, but in the end I just couldn’t picture myself there, given my low self-esteem, gradually eroded throughout my school life. By the time I reached Year 10, the barriers in my way seemed insurmountable and I dropped out of school. A few years on, I enrolled in Canning College’s Flying Start program. Although I felt I was going through the motions of Year 11 study, a personal interest in philosophy and psychology began to emerge. I was advised to join Murdoch University’s OnTrack program in order to move towards the university degree I would require if I was going to shape a future around learning and helping people. I learned a lot from OnTrack, notably that if I pushed myself and persevered then I could achieve my goals. It took me two attempts to complete the program, but I finally felt motivated by a sense of purpose and direction in my career path, and passed second time with High Distinctions. Through OnTrack, I discovered skills for learning and tailoring my education around my interests, building my confidence and teaching me the critical thinking and research skills that would be the foundations on which to build my knowledge. I am now doing my PhD in Psychology after graduating with First Class Honours in Murdoch University’s undergraduate Psychology and Philosophy course. I’m learning so much and developing new skills which provide opportunities for personal growth, both mentally and academically. Through telling my story to students, and collecting data at schools in Kalgoorlie and the Peel region, it became apparent that they were often overwhelmed by the pressure to achieve a high ATAR. They were inspired to learn that there are other pathways to achieving your goals if you persevere and are willing to put in the hard work, despite the obstacles you may face. I now have a greater understanding of young people and have developed the skills to communicate with them, as well as with their teachers and communities. It is with these skills, among all that I have gained from my academic journey, that I hope to move forward into a career as a psychologist, researcher into mental health or public speaker. 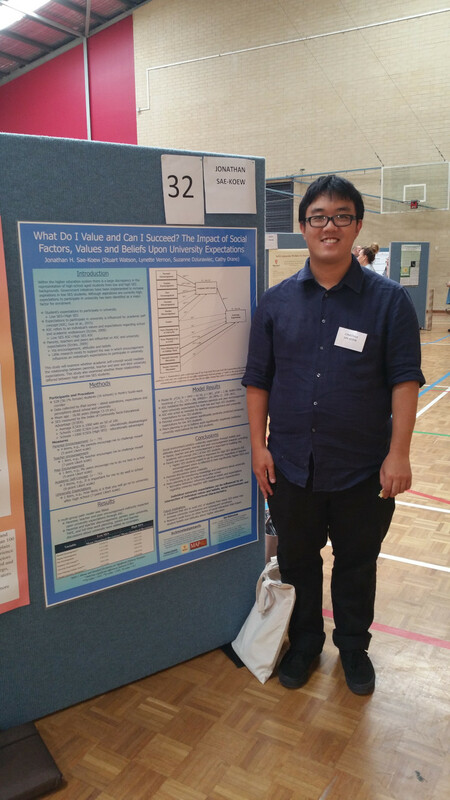 Jonathan Sae-Koew is currently completing a PhD in Psychology at Murdoch University, after achieving First Class Honours in Psychology and Philosophy at undergraduate level.